Brian Lee Cook’s Allasso Furry book series/magazine was started in 2011, announcing two volumes per year. (He and I had argued over whether this meant semi-yearly or bi-yearly. He says bi-yearly and I say semi-yearly.) Vol. 1 was published in November 2011 as a 116-page trade paperback with 14 stories and poems [review], and vol. 2 in May 2012 as a 134-page trade paperback with 11 stories and poems [review]. Frequent contributors include Mary E. Lowd, Renee Carter Hall, and Tristan Black Wolf. Vol. 3 was promised for December 2012, but never appeared, and e-mails to Cook were not answered. It was assumed that this was another “little magazine” that had ceased publication almost as soon as it had started. But vol. 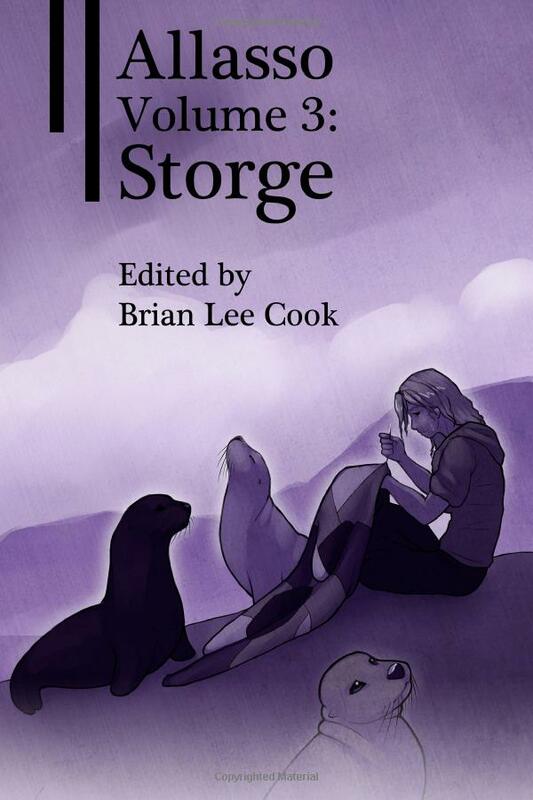 3 has finally appeared without fanfare, dated by Amazon.com as May 13, 2014, in a 140-page trade paperback edition for $8.00 (Amazon.com’s discounted price is $7.20) with 12 stories and poems, all Furry. Cook says that, considering his difficulties in publishing vol. 3, he will not promise that there will ever be a vol. 4, although he certainly hopes so. Full disclosure: I have a short story – my first fiction – in vol. 3. I think it's an important thing to note for anyone who wants to get into the publications industry or make their own anthology to not overestimate the amount of effort these things take. You have to announce it and wait for authors to submit their entry. You have to read a lot of stories to decide which to keep and which to purge. You have to copy edit each of the stories you keep and return them to the authors. Repeat the above editing process as many times as necessary. If they are a new author and it's a paying gig you have to get their information and go through the formal processes of contracts for compensation and what not (If it's a paying one). All these little things add up. This deadline thing might have been an issue where the person was inexperienced and underestimated the work load. Certainly to many six months seems like a very do-able thing, however now that I'm going through these very processes as an accepted author to an anthology, and in the process of getting kinks and finalizing my own work, I can see why this would have taken longer than they originally had expected. Especially if they have other things going on in their life like work or family. As he noted, it was perhaps not the best project to start while in graduate school. But hey, if that's when passion strikes? Sometimes you have to just go with it.